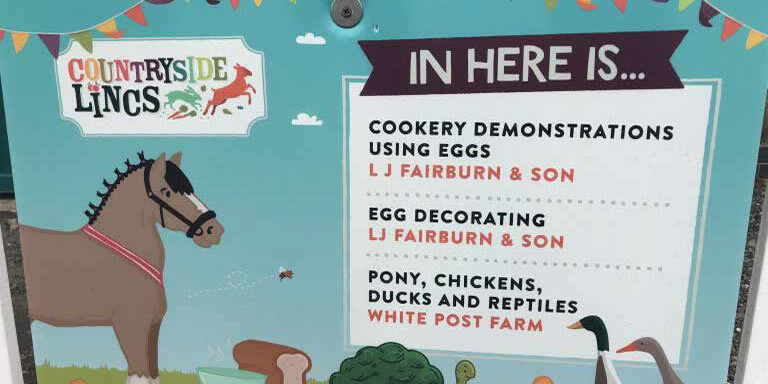 Supporting the local Lincolnshire farming community, and inspiring more people to cook, are both really important to us at Fairburn’s and so a highlight of the spring calendar is attending Countryside Lincs. The show is a fun-filled and interactive day all about food, farming and the countryside. Visitors get to meet producers, crafters, farmers and lots of animals all in one place to inspire them about Lincolnshire’s heritage. Our team were out in force at this year’s event with help from local celebrity chef Rachel Green who used our brilliant British Blue Eggs to cook up a range of delicious dishes for show-goers to sample. The Fairburn’s stand was busy from the minute the gates opened as Rachel served scrambled eggs and smoked salmon salsa, and a smoked haddock kedgeree. Lunch was corned beef hash and curried eggs, always a firm favourite, plus a new carbonara recipe. Towards the end of the day we served American-style pancakes and a choice of toppings – strawberries and clotted cream, banana and salted caramel sauce, passionfruit curd, marshmallows and Oreo biscuits. For younger visitors, we organised an egg decorating competition and were really chuffed to receive over 160 entries battling it out for prizes to a local farm park. The same weekend also saw us attend the Sophie’s Journey Ball. Sophie’s Journey is a fantastic charity that provides opportunities for families with very poorly children under the age of 18 to have a holiday. It is currently fundraising for an adapted caravan at a site not far from our Lincolnshire base. We were delighted to donate a hamper for the raffle and an auction prize of a cookery masterclass with Rachel Green for up to 8 people. We also collected donations for the charity at Countryside Lincs.